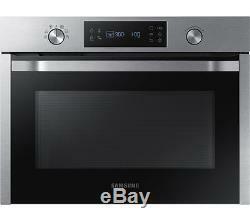 SAMSUNG NQ50K3130BS/EU Built-in Solo Microwave - Stainless Steel. Kitchen Appliances > Built-in Appliances > Built-in microwaves. Brand new & pristine product. Top features: - Generous capacity to cook more in one go - Quick and easy cleaning - Auto programs make cooking easy Generous capacity With a spacious 50 litre capacity, you can cook more at once. Easily accommodate large items like the veg for a big Sunday lunch for all the family. Quick and easy cleaning The durable, anti-bacterial ceramic enamel interior is easy to clean and scratch resistant. The Samsung NQ50K3130BS/EU Oven's inner surface can be quickly cleaned with a simple wipe of a cloth, so it's ready to use for your next meal. A steam cleaning function effectively loosens and removes food particles and stubborn stains within the microwave cavity. Simply fill the cup inside the oven with water and it quickly bathes the cavity, so residue can be easily wiped away. Handy programs Quick Defrost uses an automatic defrost algorithm to calculate the required defrosting time. The microwave then adjusts its settings accordingly, so the joint of meat for your roast will be evenly thawed and ready to cook. The Keep Warm function is great for when you're preparing several dishes at one. Use it to keep everything at the correct temperature without accidentally over-cooking until you're ready to serve. All Currys/PC World Outlet guarantees are non-transferable. Maximum microwave power: 900 W. Auto cooking programs: 6 auto cook programs including:, Auto cook. Auto defrost programs: 5 auto defrost programs. Control panel: Push buttons & dial. Box contents: Samsung NQ50K3130BS/EU Built-in Solo Microwave, Product manual. External dimensions: 454 x 595 x 570 mm (H x W x D). Boxed dimensions: 578 x 700 x 663 mm (H x W x D). Boxed weight: 38.56 kg. This product has no reviews yet, however see what our buyers say about our other products.. Small box electricals like computers, tablets, camera's, small kitchen appliances. To create your return label. Unopened - in an as new condition - unused, without installation or data input - in the same condition as supplied to you - complete with any accessories and free gifts offered with it - with the original box and unopened packaging. Unwanted products cannot be accepted after 30 days if any of the above criteria are not met. The right of cancellation does not apply in the following circumstances. When the product seal has been broken on any DVDs, CDs, memory cards or software, including games - On any personal hygiene products such as shavers, hair care products - On headphones, where the seal on the packaging is broken - If you want to return a Software Product Activation Key card which is not faulty, the silver strip on the back of the card must be fully intact as new. Complete the Reason for Return note that came with your parcel & include it in the parcel with your return. Take your parcel into any Post Office. To find your nearest Post Office. Remember to ask for a proof of return receipt from your Post Office as this will act as proof of posting should the parcel go astray. Failure to obtain this may prevent us from refunding you if your return is not received by us. Your return can be tracked using the tracking reference from your proof of return receipt by clicking Track My Return. In the same condition as supplied to you - complete with any accessories and free gifts offered with it - if possible, with the original box and packaging. The item "SAMSUNG NQ50K3130BS/EU Built-in Solo Microwave Stainless Steel" is in sale since Monday, June 26, 2017. This item is in the category "Home, Furniture & DIY\Appliances\Small Kitchen Appliances\Microwaves". The seller is "currys_pcworld" and is located in Newark. This item can be shipped to United Kingdom.